Well I have returned home. I am quite overwhelmed now with catching up and settling in after being gone for two weeks. As many of you know I have been away due to the death of my Grandfather. A man that has meant so much to me in my life. He has been my Father figure, my Grandfather, my councilor, my friend and my Hero. I loved him so much and still do. 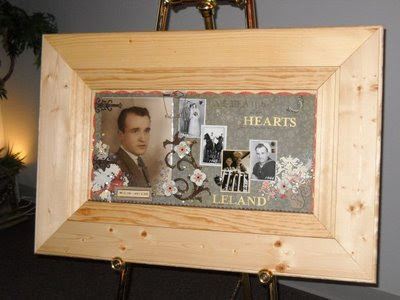 My Grandfather Leland LeRoy Bechard born May 10th 1926, lost his battle with emphysema on Wed, April 8th. Just one month shy of his 83rd Birthday. My Grandmother and Uncle were with him. I received the call as I was departing from my driveway heading to the airport to see him. I was one of the lucky few though, since I was able to spend some time with him this past December before his health got really bad. Seeing the way he has had to live for the last 5 years of his life is enough to make anyone stop smoking. I will not go there though today I will leave that soap box for another time. I want to recount all the good times He and I have shared and his wonderful life. My Grandfather's parting words to any of us who visited were always "Come back when you can't stay so long." Sarcastic... I know, but if you knew him, teasing and sarcastic comments were his way of showing you how much he loved you. The beautiful testaments to his life that were given at the funeral recalled many of these moments. The memories of how everything he touched with his loving hands were fixed and mended, be it a fiscal item or an emotional one. From my earliest memory of him, I always remember him crafting or fixing something. He was always willing to teach you anything he knew at any age. I have helped him build many things, fix shingles on roof tops, helped him make picture frames, and change an alternator in my best friend Dana's car. He was a true crafts man and knew how to work the wood into anything. He made toys big and small for many of us grandkids all of them full of love. My Grandfather served his country in the Navy. He signed up right after Pearl Harbor and was stationed in the Philippines. Though his time in service was short I believe he inspired many of us to do the same. My Uncle was a Marine, I have three cousins and a cousin-in-law who have served in the Army and I have married into USAF. After his return he married the love of his live my Grandmother Marcella. They had eight children, who have had 33 grand children who have had 32 Great Grandchildren and then also 3 Great Great Grandchildren. Each one of us showed in our own special way how much we loved him. The boys built the beautiful natural wood casket. My Grandfather insisted that we would just bury him in a pine box and stick him in the ground. Honoring his wishes the Bechard men and boys began to build him his "Pine Box" though my Grandfather should have known better. We being Bechards, put our whole heart into our work and creativity. This beautiful box represents the lessons of handy work he gave us and the love we have fore him. The Girls worked on the lining of the box and took great care to pick out a quilt and to fold and arrange the design around the head of this coffin. The lid to the casket was pronominal. It had a beautiful cross design on the top and was edged in multiple moldings. It was carefully cut to allow for an open casket and the funeral. The attention to detail was second to none. Even the time it took to search out the right pieces of wood with the best grain and color. Every inch of this was drenched with the love we all had for him. We were discussing at one point how much a custom made casket like this would cost and my cousin said "You cant put a price tag on all the love put into this one." While they were adding the finishing touches my Mother and I were working on our own project for him. We decided to make a shadow box for the funeral and ultimately for my Grandmother. Some of the best photos we had on hand were used. Photos that were important times in his life. My cousin Luke took time one night to make the frame for this out of the scraps of the coffin. After the funeral there were a few more things added per my Grandmothers request. There was a childhood photo of him and the coin the Veterans of MO gave her at the funeral. A few more of Grandpa'isms were also added and His wedding ring. This project was created with coordinating products from Cosmo Cricket's Everafter line. This saved us some time and created a wonderful backdrop to all these handsome photos of my Grandfather. Though many things were crafted in his memory. We also had relatives put his life in written words, they spoke about his life and told us stories. They reminded us of the wonderful memories we have of him. We also were blessed with a song played on the harp by my Uncle Armand's oldest daughter. Over all as my Grandmother put it... this was the most beautiful funeral she had ever attended. I want to thank everyone who made this trip possible for me; My Mother, my hubby, my Uncle Armand and Uncle Paul and their families, my Cousin Luke, my Aunt Joann, my Grandmother, my Mother-in-law, and my Sister-in-laws. Thank you all so much! I enjoyed seeing all of my family. It has been years since we were together like this.